Like many structures in New York City, 26 Wall Street, the location of Federal Hall, has played an important part in American history. 26 Wall Street started out as New York City's City Hall, established by the British as the seat of government in the area during colonial times. But after the Revolutionary War, the newly formed nation decided to make New York City its capital and the site became Federal Hall. 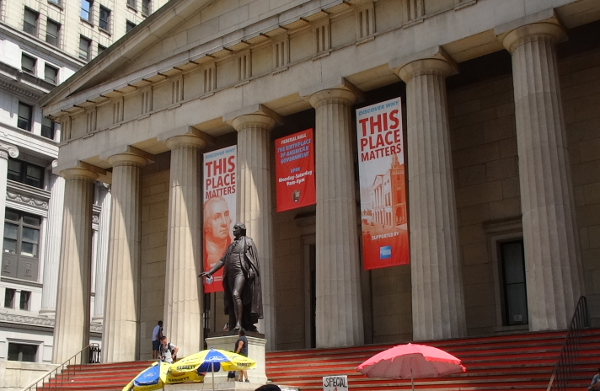 It was at the renovated and renamed Federal Hall that George Washington, the first President of the United States, was inaugurated. Later the site became the home of the Customs House for the Port of New York and later still the New York sub-Treasury storing 80% of the nations wealth. You can feel the pulse of history reverberating through the grand hall and under the ornate ceiling of this gorgeous Greek Revival style building. It's a must see for anyone interested in the history of this great nation while visiting New York City. Stature of George Washington - You will get to admire the bronze statue of George Washington standing proudly in front of Federal hall that was sculpted by John Quincy Adams Ward in 1882. Inaugural Bible - See the original Masonic Bible used during the swearing in ceremony of George Washington as the first President of the United States of America. United States Sub-Treasury Vaults - Two vaults that at one time housed more than 80% of the nations wealth are on display. 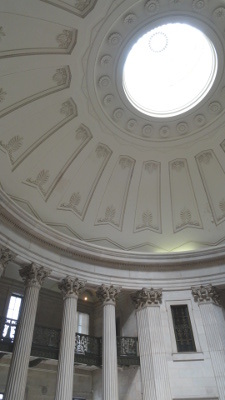 Federal Hall was used as a customs house from 1862 until 1920 when the Sub-Treasury system was replaced by the creation of the Federal Reserve system. Spring, Autumn, and Winter hours: Monday through Friday from 9:00 a.m. to 5:00 p.m., closed Saturday & Sunday. Summer hours from Memorial Day to Labor Day: Monday through Saturday from 9:00 a.m. to 5:00 p.m., closed Sunday. Self Guided and Ranger Guided tours available during visiting hours. Preferably 2, 3, 4, or 5 train, to Wall Street stop. J or Z train to the Broad Street stop. Exit at Wall and Nassau Streets. Go right (east) on Wall Street. Take the A or C train to the Fulton Street stop. Exit at John and Nassau Streets. Go right (south) on Nassau Street and turn left on Wall Street. Big Bus Tours - Downtown Loop. Big Bus Tours for more details.